Objectives: To determine whether myeloid related proteins (MRP8/MRP14), a complex of two S100 proteins related to neutrophil and monocyte activation, might be used as a marker for disease activity, and as an early indicator of relapse in juvenile idiopathic arthritis. Patients and methods: A group of 12 patients who underwent an autologous haematopoietic stem cell transplantation (ASCT) for refractory juvenile idiopathic arthritis (JIA) were studied. MRP8/MRP14 serum concentrations were determined by a sandwich enzyme linked immunosorbent assay (ELISA) as described. Improvement from baseline was described by a definition of improvement employing a core set of criteria as detailed previously by Giannini. Results: After ASCT, MRP8/MRP14 serum concentrations in JIA showed a positive correlation with the Child Health Assessment Questionnaire (CHAQ; r=0.80) and erythrocyte sedimentation rate (r=0.45), but not with the total leucocyte count (r=0.26). Mean MRP8/MRP14 serum concentrations dropped markedly in the first three months after ASCT (p=0.0039) and clinical parameters of disease activity such as CHAQ markedly improved (p=0.0039). During a transient relapse there was an increase in MRP8/MRP14. Conclusions: MRP8/MRP14 serum concentration can be used as a marker for disease activity in patients who receive an ASCT for refractory JIA. This indicates a role of macrophage activation in the pathogenesis of JIA. The occurrence of MAS in three patients in this study was not preceded by significant changes in MRP8/MRP14 concentration. Myeloid related proteins 8 (MRP8) and MRP14 are two S100 proteins specific to myeloid cells and expressed in neutrophils and monocytes. Although their exact function is not yet known, MRP8 and MRP14 may play a part in immobilising myeloid cells to endothelium. It has been suggested that the MRP8/MRP14 complex may modulate myeloid cell maturation.1 MRP8 and MRP14 have a distinct role in neutrophil and monocyte activation.2–5 Recently, Frosch et al found that MRP8 and MRP14 are specifically released during the interaction of monocytes with inflammatory activated endothelium, probably at sites of local inflammation. They showed that the serum concentrations represent a useful marker for monitoring local inflammation in oligoarticular juvenile idiopathic arthritis (JIA).6 We extended this study to other forms of JIA—namely, the polyarticular and systemic subtypes. Autologous haematopoietic stem cell transplantation (ASCT) has been described as a possible treatment for severe autoimmune disease refractory to conventional treatment, such as combinations of non-steroidal anti inflammatory drugs, anti-inflammatory drugs such as methotrexate (MTX), cyclosporin A, cyclophosphamide, prednisone, and tumour necrosis factor (TNF) receptor blocking agents.7–16 A recent study reported a follow up of 3–34 months of 12 children with severe and longstanding JIA refractory to conventional treatment who received an ASCT.9 These patients showed a marked and sustained decrease in arthritis severity as expressed in core set criteria for JIA activity and were therefore also included in this study. We here report the results of serial determination of MRP serum concentrations and disease activity in a group of 12 patients with JIA (nine with systemic JIA and three with polyarticular JIA) before and after ASCT. The inclusion criteria for an ASCT in patients with JIA are as described by Wulffraat et al.9,10 These criteria were failure to respond to at least two disease modifying antirheumatic drugs (DMARDs; including high dose MTX intramuscularly 1 mg/kg/wk), failure to respond to TNFα blocking agents, steroid dependency (>0.3 mg/kg/day needed to control symptoms), unacceptable toxicity to DMARDs or corticosteroids. Exclusion criteria were cardiorespiratory insufficiency, chronic active infection such as Epstein-Barr virus, cytomegalovirus, toxoplasmosis, spiking fever despite steroids, end stage disease (Steinbrocker IV), or poor compliance. All patients met the described inclusion criteria. The conditioning regimen and ASCT have been described previously.9,10 Haematopoietic stem cells were taken by conventional bone marrow aspiration. In patients 1–7 and 11 the graft was purged by two cycles of T cell depletion with anti-CD2 and anti-CD3 antibodies, yielding a final suspension with a CD34 positive stem cell count of 0.5–6.5×106 CD34 cells/kg and <5×105 CD3 cells/kg. In patients 8–10 and 12 the graft was purged by positive selection of CD34 positive stem cells using the Myltenyi device, which was introduced into our clinic in 1999. Thus a suspension was obtained containing 0.5–4×106 CD34 cells/kg and <0.3×105 CD3 cells/kg, which was stored in liquid nitrogen. The conditioning regimen included four days of antithymocyte globulin (Sangstat, France) in a dose of 5 mg/kg/day from day −9 to −6, cyclophosphamide in a dose of 50 mg/kg/day from day −5 to −2, and low dose total body irradiation (four gray, single fraction) on day −1. At day 0 the frozen stem cell suspension was thawed and infused. MTX and cyclosporin A were stopped before ASCT, prednisone was tapered after 2–4 months.10 Clinical follow up consisted of a three month interval evaluation of core set criteria over the first year after transplant and at 18, 24, 36, and 48 months, together with determination of MRP8/MRP14 serum concentration. Patient No 7 (table 1), developed a macrophage activation syndrome (MAS) five months after ASCT. Her MRP8/MRP14 concentrations were determined before and three months after ASCT and during MAS. Informed consent was obtained in all cases. The study was approved by the Institutional Research Board. Thirty four patients (18 male, 16 female; mean age 6.3 years, range 2–13) affected by systemic JIA (11 at initial presentation, nine during relapse, and 14 in remission) were tested as controls. In addition, 15 patients (seven male, eight female mean age 7.6 years, range 3–17) with polyarticular JIA (eight with active disease, seven in remission) were also tested. We also determined MRP8/MRP14 serum concentrations in a number of other inflammatory diseases. We included nine patients with systemic lupus erythematosus (SLE). Two of these nine also received an ASCT because of persisting nephritis, low complement, high dsDNA, and steroid dependency. Seven patients with juvenile dermatomyositis were also included. Of these seven patients, two during the initial phase had high creatine kinase (CK), skin activity, and decreased muscle strength, one during a flare with decreased muscle strength but normal CK, and four in remission with normal muscle strength and low CK levels. To exclude the possibility that decreases in MRP8/MRP14 concentrations were caused by the conditioning treatment itself and not by disease activity we also determined MRP8/MRP14 concentrations in four patients who underwent stem cell transplantation using similar conditioning regimens for relapsed leukaemia or immunodeficiencies. MRP8/MRP14 serum concentrations were determined by a sandwich enzyme linked immunosorbent assay (ELISA) system as described previously.4 For calibration different amounts (0.25–250 ng/ml) of the native complex of human MRP8 and MRP14 were used, which were isolated from human granulocytes.4 The assay has a sensitivity of <0.5 ng/ml and a linear range between 1 and 30 ng/ml. MRP8 and MRP14 form non-covalently associated complexes in the presence of extracellular calcium concentrations, which are detected by the sandwich ELISA system.17 Therefore the ELISA is calibrated with the native MRP8/MRP14 complex and the data are expressed as ng/ml MRP8/MRP14.6 The serum samples were coded, and the results represent the mean of duplicates of each of three dilutions within the linear range. We determined the MRP8/MRP14 serum concentrations before the ASCT (1–3 months) and at three months intervals after ASCT. The follow up ranged from 5–48 months (table 1). The median follow up was 24 months. Statistical analysis was performed using a Wilcoxon matched pairs signed ranks test. A preliminary investigation of outcome variables for clinical trials in childhood arthritis has been undertaken by Giannini et al.18 We use these criteria, adopted by the Paediatric Rheumatology International Trials Organisation group (PRINTO) for future trial planning to measure disease activity.19 The core set of these criteria consists of (a) doctor’s global assessment of disease activity; (b) parent/patient assessment of overall wellbeing (a visual analogue scale as part of the Child Health Assessment Questionnaire (CHAQ)); (c) functional ability (disability as measured by the CHAQ); (d) number of joints with active arthritis (Fuchs Swelling Index); (e) number of joints with limited range of motion, (EPM-ROM); and (f) erythrocyte sedimentation rate (ESR).20–22 The definition of improvement used to assess disease response employs these six variables by analogy with the American College of Rheumatology criteria for improvement of rheumatoid arthritis under treatment. To meet the definition of a 30% improvement the patients had to have a 30% improvement from baseline in at least three of five response variables. They could also have a worsening of 30% or more in no more than one out of six response variables. Patients were also evaluated for 50% and 70% improvement. We calculated the improvement estimates at the most recent follow up (table 1). Clinical follow up (up to three years) after ASCT, for 11 of the 12 patients, has been described previously.18 In two patients the ESR increased again after three months with a mild and transient synovitis of the hip and knee after a varicella zoster virus infection or tonsillitis. One patient had a transient synovitis of one elbow two weeks after an MMR vaccination, which resolved within two weeks. These transient relapses were treated with low dose steroids for less than three months or required no treatment at all. 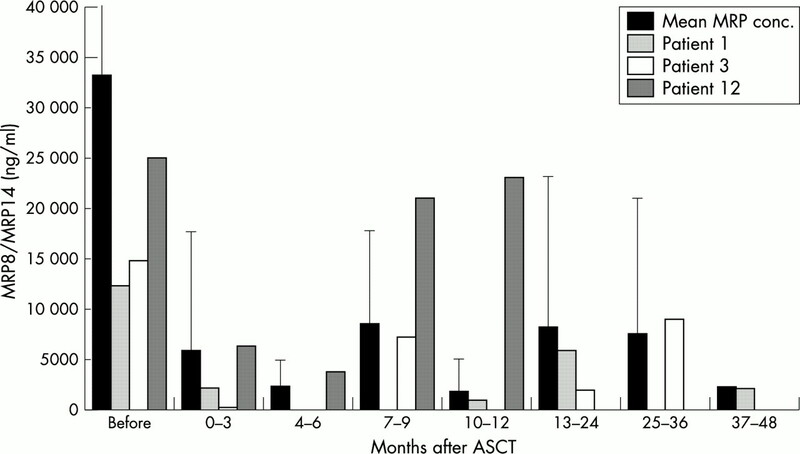 In 10 patients with JIA MRP8/MRP14 serum concentrations strongly decreased after ASCT. The mean MRP8/MRP14 concentration dropped from 33 029 ng/ml (248 600–660 ng/ml) to 5820 ng/ml (48 200–100 ng/ml) in the first three months after ASCT (p=0.0039) (fig 1). In six of 12 patients MRP8/MRP14 serum concentrations reached normal values within the first three months. In parallel with the decrease in MRP8/MRP14 serum concentration there was a decrease in measures of clinical disease activity. Table 2 shows, as an example of this, the mean total CHAQ values. Mean CHAQ dropped from 4.98 (7.0–3.6) before ASCT to 2.35 (3.8–0.1) in the first three months after ASCT (p=0.0039), indicating a decrease in disease activity. Eight of 12 patients maintained normal MRP8/MRP14 serum concentrations during a period of up to four years’ follow up after ASCT. These patients all showed >70% decrease in disease activity. 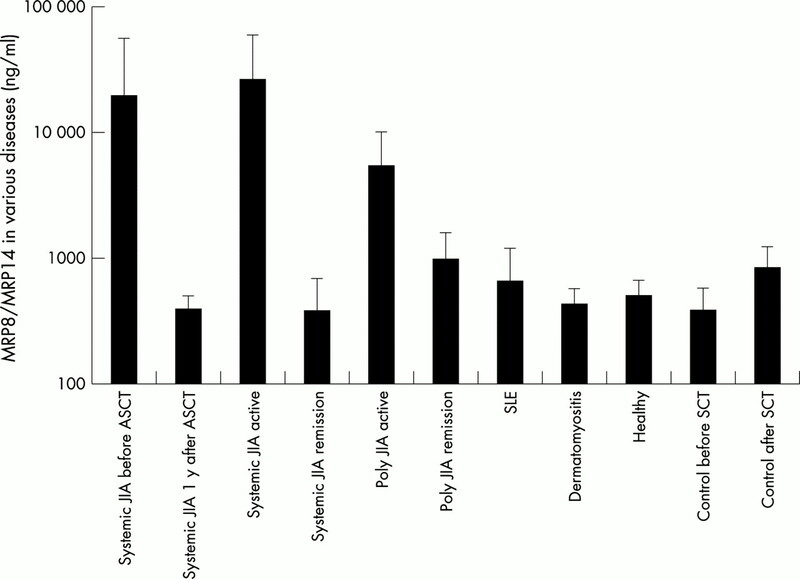 MRP8/MRP14 serum concentration decreases after stem cell transplantation. Patient 8 (table 1) did not reach a normal MRP8/MRP14 value, but did show a clear decrease in MRP8/MRP14 serum concentration from 248 600 ng/ml before ASCT to 41 500 ng/ml two years after ASCT. At the last follow up at two years this patient showed a 50% improvement. Patient 12 had a persistent relapse (<30% improvement) after seven months. He showed an initial decrease in MRP8/MRP14 concentration from 25 000 ng/ml before ASCT to 3730 ng/ml five months after ASCT (corresponding with a 50% improvement). Then his MRP8/MRP14 concentration increased concurrently with a clinical relapse to 23 000 ng/ml at 8–11 months’ follow up, comparable with his pre-transplant MRP8/MRP14 values (fig 1). Patient 3 (table 1 and fig 1) showed an improvement of only 30% (because of a high ESR and high CHAQ) but did show some decrease in MRP8/MRP14 concentration from 14 800 ng/ml before ASCT to 9000 ng/ml 30 months after ASCT. Patient 1 (fig 1) showed a decrease of 12 000 (level before ASCT) to 900 ng/ml during a period of 70% improvement. Two years after ASCT she had a transient flare of fever and arthritis (associated with a streptococcal throat infection) and a concomitant (transient) rise in MRP levels to 5900. Figure 2 shows the relation between ESR and MRP serum concentration in patients with systemic JIA divided into a before and after ASCT group. 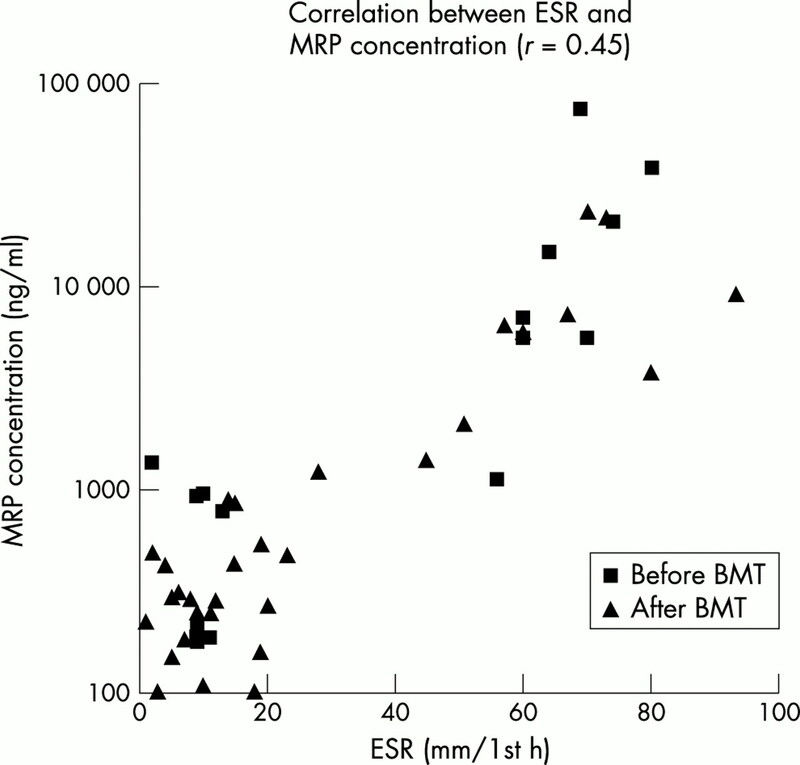 The ESR correlated positively with MRP serum concentration in both groups (r=0.45). Correlations between MRP8/MRP14 concentrations and leucocyte (r=0.26) or neutrophil counts (r=0.29) were not significant. Figure 3 shows the MRP serum concentrations in various control groups and healthy controls. Note that the MRP serum concentrations in patients were not followed up longitudinally. Thus MRP values of individual patients during initial presentation, remission, or flare cannot be compared. As a group, however, the differences between systemic JIA with active disease and systemic JIA were statistically significant. After transplant MRP8/MRP14 concentrations decreased significantly and reached normal levels that were comparable with those in JIA that has gone into remission after conventional treatment. In SLE and dermatomyositis MRP8/MRP14 serum concentrations were not significantly raised. In dermatomyositis, the MRP8/MRP14 levels were very low, both in the three patients with active disease (two of whom had raised CK levels) and the four patients with dermatomyositis in remission. It remains possible that MRP is related to CK levels, and may be raised in the initial phase of juvenile dermatomyositis. Correlation between ESR and MRP8/MRP14 concentration. BMT, bone marrow transplant. Please note the logarithmic scale of the y axis. MRP8/MRP14 serum concentrations in different autoimmune diseases and healthy controls. SCT, stem cell transplant. Data are presented as means (SEM). Please note the logarithmic scale of the y axis. Two patients with SLE treated with ASCT showed low MRP8/MRP14 concentrations before and at the six month follow up after ASCT all within the normal range (50–720 ng/ml). In four patients with relapsed leukaemia treated with allogeneic SCT, changes in MRP8/MRP14 values ranged from 220 ng/ml to 880 ng/ml from one month before to one month after ASCT. These concentrations are within normal values. In one patient with JIA who developed MAS five months after ASCT, MRP8/MRP14 concentrations were 930 ng/ml before ASCT and 225 ng/ml three months after ASCT. Two months later she developed MAS, and MRP8/MRP14 values were determined twice within five days and were 500 ng/ml and 185 ng/ml. Frosch et al assumed that MRP8 and MRP14 might be released at sites of local inflammation during interaction of pre-activated phagocytes and TNF stimulated endothelium and thus would be reliable markers of local activity of the phagocyte system during inflammatory processes.6 MRP8/MRP14 is not produced by hepatocytes or B cells. Oligoarthritis represents a local activation of phagocytes, thus MRP is a local marker here, in contrast with systemic JIA with its systemic activation of phagocytes. Conventional markers—for example, ESR and C reactive protein (CRP), lack the required sensitivity and specificity because they reflect acute phase responses mediated by hepatocytes or B lymphocytes rather than activation of phagocytes during inflammation.6 Transient or persistent relapse in three patients after ASCT was accompanied by an increase in MRP8/MRP14 serum concentration. One patient with JIA with a persistent relapse after ASCT showed an increase in MRP8/MRP14 serum concentration exceeding the pre-transplant concentration. The significant increase in MRP8/MRP14 concentration during active JIA and the correlation with disease activity support the assumption that phagocytes excreting MRP8 and MRP14 play a part in the pathogenesis of JIA. It has been postulated that MRP8 and MRP14 induce expression of chemoattractants through specific receptors.6 This process activates nuclear factor κB, which has a role in gene regulation during inflammatory stimulation of endothelium. In addition, the occurrence of MAS in JIA also favours the concept of abnormal macrophage function in the pathogenesis of the disease. The observed MRP increases seem to be specific for chronic arthritis because other autoimmune disorders such as SLE or dermatomyositis, whether active or in remission, do not show raised values. Here CRP and ESR may be low in the presence of active disease. In these diseases there is no correlation between MRP and ESR. Further studies of patients with dermatomyositis at presentation are needed to see if there is a correlation with CK values. To examine the issue of specificity further, it would be of interest to test children with chronic infectious diseases such as osteomyelitis or cystic fibrosis. In a group of patients treated with stem cell transplantation for other diseases—for example, SLE (n=2) or leukaemia (n=4), the MRP8/MRP14 concentrations do not change significantly, indicating that the decrease in MRP8/MRP14 serum concentration found in the group of patients with JIA is not due to the conditioning regimen but specifically reflects disease activity of JIA. This study was supported in part by a grant from the Dutch League Against Rheumatism. The authors thank Ger Rijkers for help with the statistical analysis. Guignard F, Mauel J, Markert M. Identification and characterization of a novel human neutrophil protein related to the S100 family. Biochem J1995;309(pt 2):395–401. Newton RA, Hogg N. The human S100 protein MRP-14 is a novel activator of the beta 2 integrin Mac-1 on neutrophils. J Immunol1998;160:1427–35. Lemarchand P, Vaglio M, Mauel J, Markert M. Translocation of a small cytosolic calcium-binding protein (MRP-8) to plasma membrane correlates with human neutrophil activation. J Biol Chem1992;267:19379–82. Rammes A, Roth J, Goebeler M, Klempt M, Hartmann M, Sorg C. Myeloid-related protein (MRP) 8 and MRP14, calcium-binding proteins of the S100 family, are secreted by activated monocytes via a novel, tubulin-dependent pathway. J Biol Chem1997;27:9496–502. Melkonyan H, Hofmann HA, Nacken W, Sorg C, Klempt M. The gene encoding the myeloid-related protein 14 (MRP14), a calcium-binding protein expressed in granulocytes and monocytes, contains a potent enhancer element in the first intron. J Biol Chem1998;273:27026–32. Frosch M, Strey A, Vogl T, Wulffraat NM, Kuis W, Sunderkotter C, et al. Myeloid-related proteins 8 and 14 are specifically secreted during interaction of phagocytes and activated endothelium and are useful markers for monitoring disease activity in pauciarticular-onset juvenile rheumatoid arthritis. Arthritis Rheum2000;43:628–7. Sherry DD. What’s new in the diagnosis and treatment of juvenile rheumatoid arthritis. J Pediatr Orthop2000;20:419–20. Pisetsky DS. Tumor necrosis factor blockers in rheumatoid arthritis. N Engl J Med2000;342:810–11. Wulffraat NM, Sanders LA, Kuis W. Autologous hemopoietic stem-cell transplantation for children with refractory autoimmune disease. Curr Rheumatol Rep2000;2:316–23. Wulffraat NM, van Royen A, Bierings M, Vossen J, Kuis W. Autologous haemopoietic stem-cell transplantation in four patients with refractory juvenile chronic arthritis. Lancet1999;353:550–3. Joske DJ, Ma DT, Langlands DR, Owen ET. Autologous bone-marrow transplantation for rheumatoid arthritis. Lancet1997;350:337–8. Tyndall A, Black C, Finke J, Winkler J, Mertlesmann R, Peter HH, et al. Treatment of systemic sclerosis with autologous haemopoietic stem cell transplantation. Lancet1997;349:254. Marmont AM, van Lint MT, Gualandi F, Bacigalupo A. Autologous marrow stem cell transplantation for severe systemic lupus erythematosus of long duration. Lupus1997;6:545–8. Tyndall A, Gratwohl A. Bone marrow transplantation in the treatment of autoimmune diseases. Br J Rheumatol1997;36:1–3. Brooks PM, Atkinson K, Hamilton JA. Stem cell transplantation in autoimmune disease. J Rheumatol1995;22:1809–11. Fassas A, Anagnostopoulos A, Kazis A, Kapinas K, Sakellari I, Kimiskidis V, et al. Peripheral blood stem cell transplantation in the treatment of progressive multiple sclerosis: first results of a pilot study. Bone Marrow Transplant1997;20:631–8. Roth J, Teigelkamp S, Wilke M, Grun L, Tummler B, Sorg C. Complex pattern of the myelo-monocytic differentiation antigens MRP8 and MRP14 during chronic airway inflammation. Immunobiology1992;186:304–14. Ruperto N, Ravelli A, Falcini F, Lepore L, De Sanctis R, Zulian F, et al. Performance of the preliminary definition of improvement in juvenile chronic arthritis patients treated with methotrexate. Italian Pediatric Rheumatology Study Group. Ann Rheum Dis1998;57:38–41. Singh G, Athreya BH, Fries JF, Goldsmith DP. Measurement of health status in children with juvenile rheumatoid arthritis. Arthritis Rheum1994;37:1761–9. Fuchs HA, Pincus T. Reduced joint counts in controlled clinical trials in rheumatoid arthritis. Arthritis Rheum1994;37:470–5. Len C, Ferraz MB, Goldenberg J, Oliveira LM, Araujo PP, Quaresma MR, et al. Pediatric Escola Paulista de Medicina Range of Motion Scale: a reduced joint count scale for general use in juvenile rheumatoid arthritis. J Rheumatol1999;26:909–13. Mouy R, Stephan JL, Pillet P, Haddad E, Hubert P, Prieur AM. Efficacy of cyclosporine A in the treatment of macrophage activation syndrome in juvenile arthritis: report of five cases. J Pediatr1996;129:750–4. Grom AA, Passo M. Macrophage activation syndrome in systemic juvenile rheumatoid arthritis. J Pediatr1996;129:630–2. Ravelli A, De Benedetti F, Viola S, Martini A. Macrophage activation syndrome in systemic juvenile rheumatoid arthritis successfully treated with cyclosporin. J Pediatr1996;128:275–8. Quartier P, Prieur AM, Fischer A. Disseminated toxoplasmosis following autologous bone marrow transplantation for systemic onset juvenile chronic arthritis. Lancet1999;353:1885–6. Odink K, Cerletti N, Bruggen J, Clerc RG, Tarcsay L, Zwadlo G, et al. Two calcium-binding proteins in infiltrate macrophages of rheumatoid arthritis. Nature1987;330:80–2. Roth J, Goebeler M, van den BC, Sorg C. Expression of calcium-binding proteins MRP8 and MRP14 is associated with distinct monocytic differentiation pathways in HL-60 cells. Biochem Biophys Res Commun1993;191:565–70. Roth J, Goebeler M, Wrocklage V, van den BC, Sorg C. Expression of the calcium-binding proteins MRP8 and MRP14 in monocytes is regulated by a calcium-induced suppressor mechanism. Biochem J1994;301(pt 3):655–60. van Bekkum DW. Effectiveness and risks of total body irradiation for conditioning in the treatment of autoimmune disease with autologous bone marrow transplantation. Rheumatology (Oxford)1999;38:757–61. Stephan JL, Zeller J, Hubert P, Herbelin C, Dayer JM, Prieur AM. Macrophage activation syndrome and rheumatic disease in childhood: a report of four new cases. Clin Exp Rheumatol1993;11:451–6.